Event Safety Plan organises your work into projects. You can use a project to hold the various safety plans that you might produce for an event, festival, tour or show. Think of a project like a folder on your desktop. Within each project you can have a collection of safety plans that you've produced for the project. Project - "My Great Festival 2018"
Construction Phase Safety Plan for the build & dismantle phase of the project. Fire Safety Plan that details your fire strategy and risk assessment. Whilst there are some guidelines to what information needs to be included within a safety plan under CDM 2015, most people approach safety planning in a way that is relevant and appropriate to their circumstances. For smaller events for example, all the information above could be contained within a single safety plan document. 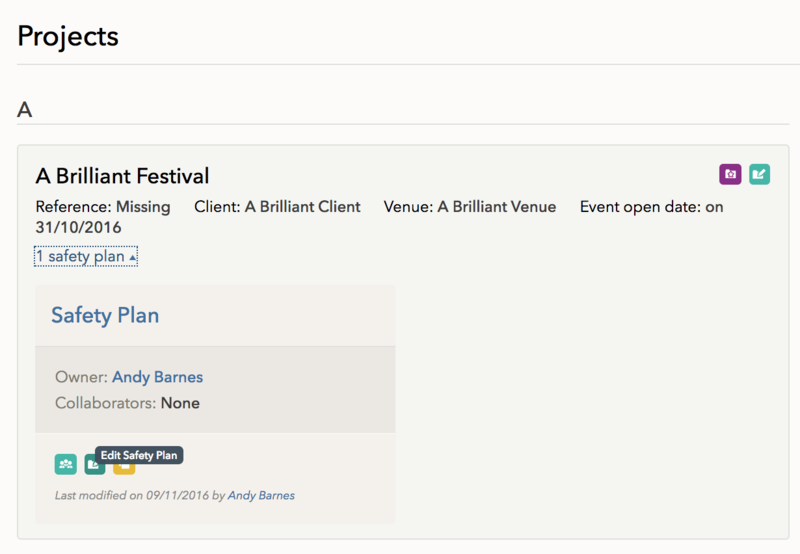 When you first log into Event Safety Plan you’ll be taken to your projects page. You’ll be asked to enter some basic project details. These will be used for searching your plans and in the headings when you export your documents. Project Name – This will be the name that your project is displayed under in Event Safety Plan, it will also be used in your exported documents. Reference - This can be an internal reference number that your organisations uses for your projects. It makes searching for them easier if you want to search by your reference number. Client – This will be used for searching your projects and in your exported documents. Venue – This will be used for searching your projects and in your exported documents. Event Open Date – This will be used for searching your projects and in your exported documents. Whilst starting up your project you can add your first safety plan to it. You can read more about adding collaborators here. You also have the choice of starting your safety plan from an existing document. Copy from an Existing Safety Plan - This will create a duplicate of an existing safety plan for you to start from. This is especially useful when you are running a similar event to one you've already done, or are doing the same event again eg. an annual festival. 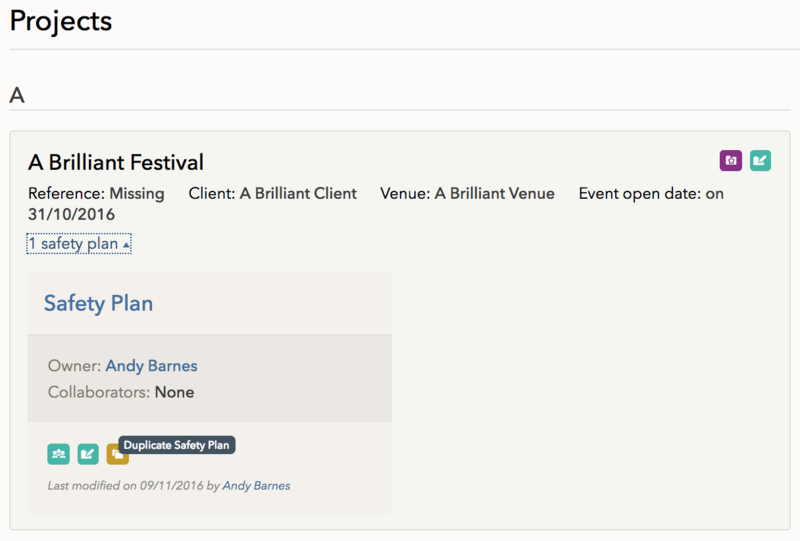 The tool creates a copy of all of the elements of your previous safety plan and marks them as 'Requires Review' as a reminder to check that they are still relevant and site specific for the new event. Even though many things still may be the same, all elements of the safety plan should be reviewed to ensure that they are still suitable and sufficient for the new event. Start from Template Safety Plan - If your team administrator has set up template safety plans for you then you can use them as the basis for your new safety plans. This option will copy all of the elements from the template into your safety plan for you to review and fill in. You can duplicate an existing safety plan on the project management page by clicking the Duplicate Safety Plan’ button. To edit the safety plan name or other details once it’s been created, click the Edit Safety Plan button to take you to the safety plan edit screen. You can delete a safety plan by clicking the Edit Safety Plan button and clicking the ‘Delete Safety Plan’ link at the bottom. Please note this is permanent and can’t be undone! Once you've finished a project, you can archive it. The project & safety plans are hidden from your dashboard but the sections, risk assessments & supporting docs are still available to duplicate from if you select to also search achieved projects. 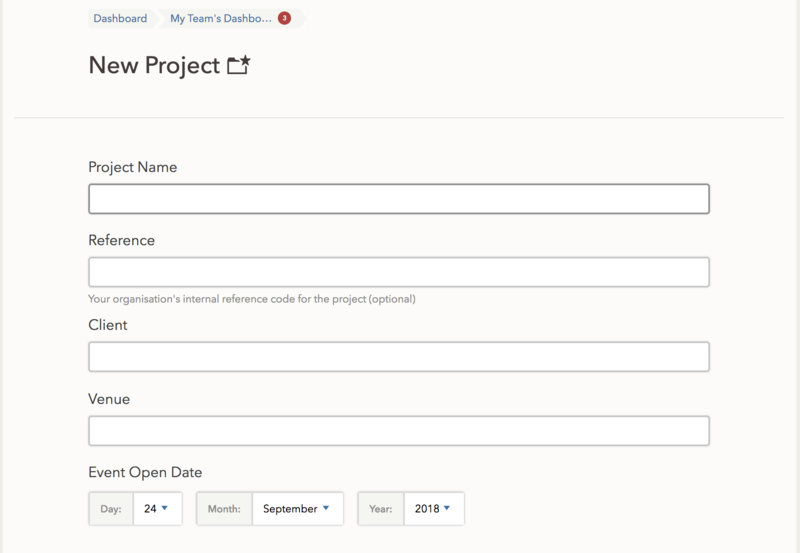 You can archive a project on the Project Information Page. 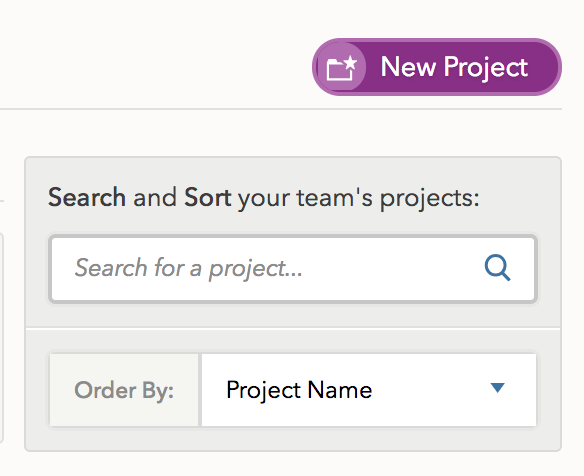 Archive projects can be viewed in the project archive on your team dashboard. To delete a project, you need to delete all the safety plans contained within it.